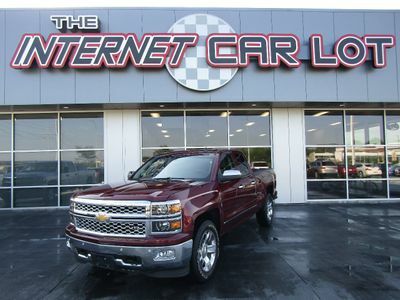 Check out this very nice 2013 Chevrolet Silverado 1500 LTZ Crew Cab 1500 4x4! This truck looks and drives excellent! It's loaded with great options including 4x4, 5.3L V8, Rear View Camera, Leather, Dual Heated Seats, Cooled Seats, Dual Power Seats, Memory Driver's Seat, Dual Climate Control, XM Satellite Radio, Bose Premium Audio, Power Adjustable Pedals, Polished Wheels, Steering Wheel Controls, Tow Package, Spray-in Bedliner, Bluetooth, USB, Power Windows, Locks, Tilt, Cruise, CD, OnStar, Home Link, and much more! Overall this truck is very clean inside and out! It's priced to sell ASAP so call 402.991.1112! If you would like to see the vehicle in person, please contact us at 402.991.1112. Get Pre-Approved now on our website http://TheInternetCarLot.com or call us at 402.991.1112!